Should I buy new or reupholster? This question is almost always your first question when you start to consider buying new furniture or just having your old furniture redone. There is no simple answer to this question. Finance, sentimental value, fabric choice, condition of the piece; there are so many things that you should consider when making this decision that it's impossible for us to give you a simple answer. I can tell you without reservation that the construction of older furniture is much more substantial than what you will find from today's high volume furniture manufacturers. What happens to my furniture from start to finish? Briefly; we remove old covering and filling to the bare frame. We check the frame for motion and stability and if necessary replace worn joints or repair them. We inspect springs, webbing etc. and replace if required. We retie coil springs, replace the fillings and padding with new if necessary. We trace, cut and sew fabric components and apply these to your frame. 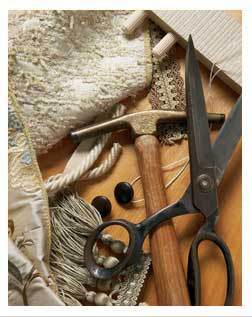 We add finishing trims and finally the finished product is inspected for quality and workmanship. Yes, we have a wide range of fabric samples from leading fabric houses. Whether your needs are furniture fabric, vinyl, or exotic leather; we can provide it. Yes, we offer pick up and delivery in the Washtenaw County and surrounding county areas.